As far back as the middle of the last century, it was recognized that the heart, overtaxed by constant emotional influences or excessive physical effort and thus deprived of its appropriate rest, suffers disorders of function and becomes vulnerable to disease. An early editorial on the relationships between stress and the heart accepted the proposition that in about half of patients, strong emotional upsets precipitated heart failure. Unspecified negative emotional arousal, often described as stress, distress or upset, has been associated with a variety of pathological conditions, including hypertension,[26, 27] silent myocardial ischemia, sudden cardiac death, coronary disease,[30-32] cardiac arrhythmia, sleep disorders, metabolic syndrome, diabetes,[36, 37] neurodegenerative diseases, fatigue[39, 40] and many other disorders. Stress and negative emotions have been shown to increase disease severity and worsen prognosis for individuals suffering from a number of different pathologies. [42, 43] On the other hand, positive emotions and effective emotion self-regulation skills have been shown to prolong health and significantly reduce premature mortality. [44-49] From a psychophysiological perspective, emotions are central to the experience of stress. It is the feelings of anxiety, irritation, frustration, lack of control, and hopelessness that are actually what we experience when we describe ourselves as stressed. Whether it’s a minor inconvenience or a major life change, situations are experienced as stressful to the extent that they trigger emotions such as annoyance, irritation, anxiety and overwhelm. In essence, stress is emotional unease, the experience of which ranges from low-grade feelings of emotional unrest to intense inner turmoil. Stressful emotions clearly can arise in response to external challenges or events, and also from ongoing internal dialogs and attitudes. Recurring feelings of worry, anxiety, anger, judgment, resentment, impatience, overwhelm and self-doubt often consume a large part of our energy and dull our day-to-day life experiences. Our emotions infuse life with a rich texture and transform our conscious experience into a meaningful living experience. Emotions determine what we care about and what motivates us. They connect us to others and give us the courage to do what needs to be done, to appreciate our successes, to protect and support the people we love and have compassion and kindness for those who are in need of our help. Emotions are also what allow us to experience the pain and grief of loss. Without emotions, life would lack meaning and purpose. Emotions and resilience are closely related because emotions are the primary drivers of many key physiological processes involved in energy regulation. We define resilience as the capacity to prepare for, recover from and adapt in the face of stress, adversity, trauma or challenge. Therefore, it follows that a key to sustaining good health, optimal function and resilience is the ability to manage one’s emotions. It has been suggested that resilience should be considered as a state rather than a trait and that a person’s resilience can vary over time as demands, circumstances and level of maturity change. 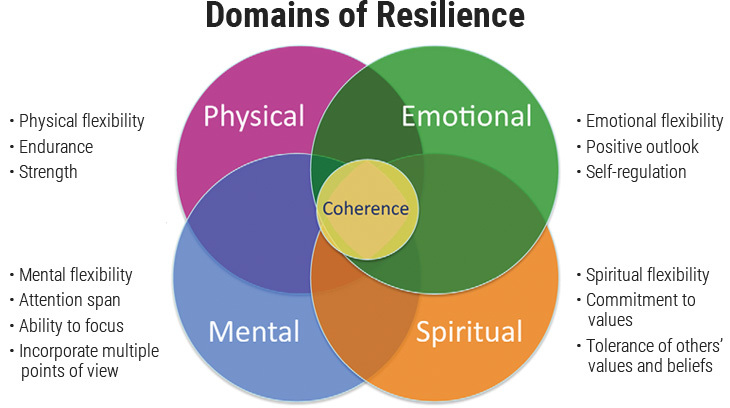 In our resilience training programs, we suggest that the ability to build and sustain resilience is related to self-management and efficient utilization of energy resources across four domains: physical, emotional, mental and spiritual (Figure 2.1). Physical resilience is basically reflected in physical flexibility, endurance and strength, while emotional resilience is reflected in the ability to self-regulate, degree of emotional flexibility, positive outlook and supportive relationships. Mental resilience is reflected in the ability to sustain focus and attention, mental flexibility and the capacity for integrating multiple points of view. Spiritual resilience is typically associated with commitment to core values, intuition and tolerance of others’ values and beliefs. Figure 2.1 Domains of Resilience. By learning self-regulation techniques that allow us to shift our physiology into a more coherent state, the increased physiological efficiency and alignment of the mental and emotional systems accumulates resilience (energy) across all four energetic domains. Having a high level of resilience is important not only for bouncing back from challenging situations, but also for preventing unnecessary stress reactions (frustration, impatience, anxiety), which often lead to further energy and time waste and deplete our physical and psychological resources. Most people would agree it is the ability to adjust and self-regulate one’s responses and behavior that is most important in building and maintaining supportive, loving relationships and effectively meeting life’s demands with composure, consistency and integrity. The ability to adjust and self-regulate also is central to resilience, good health and effective decision-making. It is a key for success in living life with greater kindness and compassion in all relationships. If people’s capacity for intelligent, self-directed regulation is strong enough, then regardless of inclinations, past experiences or personality traits, they usually can do the adaptive or right thing in most situations. It has been shown that our efforts to self-regulate emotions can produce broad improvements in increasing or strengthening self-regulatory capacity, similar to the process of strengthening a muscle, making us less vulnerable to depletion of our internal reserves. When internal energy reserves are depleted, normal capacity to maintain self-control is weakened, which can lead to increased stress, inappropriate behaviors, lost opportunities, poor communication and damaged relationships. Despite the importance of self-directed control, many people’s ability to self-regulate is far less than ideal. In fact, failures in self-regulation, especially of emotions and attitudes, arguably are central to the vast majority of personal and social problems that plague modern societies. For some, the lack of selfregulatory capacity can be attributed to immaturity or failure to acquire skills while for others it can be the result of trauma or impairment in the neural systems that underlie one’s ability to self-regulate. Therefore, we submit the most important skill the majority of people need to learn is how to increase their capacity to self-regulate emotions, attitudes and behaviors. Self-regulation enables people to mature and meet the challenges and stresses of everyday life with resilience so they can make more intelligent decisions by aligning with their innate higher-order wisdom and expression of care and compassion, elements we often associate with living a more conscientious life. Our research suggests a new inner baseline reference can be established by using the HeartMath (HM) self-regulation techniques that help people replace depleting emotional undercurrents with more positive, regenerative attitudes, feelings and perceptions. This new baseline, which will be summarized in a later section, can be thought of as a type of implicit memory that organizes perception, feelings and behavior. [5, 59] The process of establishing a new baseline takes place at the physiological level, which is imperative for sustained and lasting change to occur. Positive emotions are a reliable predictor of better health, even for those without food or shelter while negative emotions are a reliable predictor of worse health even when basic needs like food, shelter and safety are met. Dating back to the ancient Greeks, human thinking and feeling, intellect and emotion have been considered separate functions. These contrasting aspects of the soul, as the Greeks called them, often have been portrayed as being engaged in a constant battle for control of the human psyche. In Plato’s view, emotions were like wild horses that had to be reined in by the intellect and willpower. Research in neuroscience confirms that emotion and cognition can best be thought of as separate but interacting functions and systems that communicate via bidirectional neural connections between the neocortex, the body and emotional centers such as the amygdala and body. These connections allow emotion-related input to modulate cortical activity while cognitive input from the cortex modulates emotional processing. However, the neural connections that transmit information from the emotional centers to the cognitive centers in the brain are stronger and more numerous than those that convey information from the cognitive to the emotional centers. This fundamental asymmetry accounts for the powerful influence of input from the emotional system on cognitive functions such as attention, perception and memory as well as higher-order thought processes. Conversely, the comparatively limited influence of input from the cognitive system on emotional processing helps explain why it is generally difficult to willfully modulate emotions through thought alone. There can be differences from one individual to the next in these reciprocal connections and interactions between the cognitive and emotional systems that affect the way we perceive, experience and eventually remember our emotional experiences, and how we respond to emotionally challenging situations. Unbalanced interactions between the emotional and cognitive systems can lead to devastating effects such as those observed in mood and anxiety disorders. Although there has been a historical bias favoring the viewpoint that emotions interfere with and can be at odds with rational thinking, which of course can occur in some cases, emotions have their own type of rationality and have been shown to be critical in decision-making. For example, Damasio points out, patients with damage in areas of the brain that integrate the emotional and cognitive systems can no longer effectively function in the day-to-day world, even though their mental abilities are perfectly normal. In the mid-1990s, the concept of emotional intelligence was introduced, precipitating persuasive arguments that the viewpoint of human intelligence being essentially mind intellect was far too narrow. This was because it ignored a range of human capacities that bear equal if not greater weight in determining our successes in life. Qualities such as self-awareness, motivation, altruism and compassion, but especially one’s ability to self-regulate and control impulses and self-direct emotions were found to be as important or more important than a high IQ. Those qualities, more so than IQ, enable people to excel in the face of life’s challenges. It is our experience that the degree of alignment between the mind and emotions can vary considerably. When they are out of sync, it can result in radical behavior changes that cause us to feel like there are two different people inside the same body. It can also result in confusion, difficulty in making decisions, anxiety and a lack of alignment with our deeper core values. Conversely, when the mind and emotions are in sync, we are more self-secure and aligned with our deeper core values and respond to stressful situations with increased resilience and inner balance. As will be discussed in more detail in a later section, we use the terms cardiac coherence, physiological coherence and heart coherence interchangeably to describe the measurement of the order, stability and harmony in the oscillatory outputs of the body’s regulatory systems during any period of time. Because emotions exert such a powerful influence on cognitive activity, intervening at the emotional level is often the most efficient way to initiate change in mental patterns and processes. Our research demonstrates that the application of emotion self-regulation techniques along with the use of facilitative technology (emWave®, Inner Balance™) can help people bring the heart, mind and emotions into greater alignment. Greater alignment is associated with improved decision- making, creativity, listening ability, reaction times and coordination and mental clarity.